Princess Augusta of Cambridge was born on 19 July 1822 at the Montbrillant Palace in Hanover, the elder daughter of Prince Adolphus and Princess Augusta, the Duke and Duchess of Cambridge. A granddaughter of King George III of the United Kingdom and niece of the reigning King George IV, at the time of her birth Princess Augusta was 9th in the line of succession to the British throne. Princess Augusta was christened into the Church of England at the Montbrillant Palace on 16 August 1822 receiving the names Augusta Caroline Charlotte Elizabeth Mary Sophia Louisa. Her godparents were: her paternal aunts and uncle Prince Frederick the Duke of York, the Dowager Queen Charlotte of Württemberg, the Princess Augusta, the Landgravine Elizabeth of Hesse-Homburg, Princess Mary the Duchess of Gloucester and the Princess Sophia, her maternal aunts the Grand Duchess Marie of Mecklenburg-Strelitz and Landgravine Louise of Hesse-Kassel, her maternal aunt by marriage Landgravine Louise Charlotte of Hesse-Kassel, her maternal grandmother Landgravine Caroline of Hesse-Kassel, her maternal great aunt Princess Louisa of Nassau-Usingen and the Electress Augusta of Hesse-Kassel. Princess Augusta spent her early childhood in the Kingdom of Hanover where her father had been serving since October 1816 as Governor General (later styled Viceroy) for his father King George III, then his brothers the King’s George IV and William IV. Within her family Princess Augusta was the middle child, her elder brother Prince George having been born in 1819 while her younger sister Princess Mary Adelaide was born in 1833. In Hanover the Cambridge family lived at the Leine Palace and the Montbrillant Palace. Princess Augusta and her siblings had an enjoyable childhood there with frequent dances held for the entertainment of them and other children. She received her early education from her governess Herminie Chavannes, a native of Switzerland who later went to write a number of children’s books and biographies. Princess Augusta’s first visit to her family’s main realm, the United Kingdom, took place in the summer of 1825. During the trip the young princess and her elder brother Prince George took their first steps in a lifetime of royal service by becoming patrons of the Annual Juvenile Fete at Vauxhall Gardens, Princess Augusta however was deemed to be too young to join her parents and brother in attending in person. A further visit to Britain occurred in the summer of 1831 for the coronation of her uncle King William IV. In addition to her uncle’s coronation, Princess Augusta also made a number of other public appearances during this trip, once again becoming patron of the Vauxhall Gardens Juvenile Fete which she attended in person, as well as appearing at other public events such as army inspections. She returned with her family to Britain again in 1835 for her brother’s confirmation. It was during these visits that Princess Augusta would first get to know the other members of the British Royal Family. In 1837 Princess Augusta and her family took up permanent residence in Britain with her father’s role in Hanover ending along with the personal union between the two crowns on the death of King William IV and the succession in Britain of his niece Princess Victoria of Kent, and in Hanover of his brother Prince Ernest Augustus the Duke of Cumberland. Having been living in Hanover’s royal palaces, once Princess Augusta and her family moved to Britain they settled into the more modest Cambridge Cottage in Kew and Cambridge House in central London. Once in Britain permanently Princess Augusta was able to regularly meet with her other relatives in the Royal Family, in particular her royal aunts. In June 1838 Princess Augusta attended her second British coronation, witnessing her cousin Victoria’s crowning as queen at Westminster Abbey. In March the following year Princess Augusta was confirmed in the Church of England in a ceremony led by the Bishop of London at the Chapel Royal in the presence of her parents and cousin Queen Victoria. Following her confirmation Princess Augusta made her debut into society and began to socialise with prominent figures in British life at the various dinners and balls held in the capital. In late 1840 Princess Augusta accompanied her parents and siblings on a visit to continental Europe, staying with her mother’s family at the Rumpenheim Palace which hosted regular family reunions. Princess Augusta, her mother and sister’s trip around the continent continued onto Munich, and then Rome where they took in the culture of city visiting the art galleries and churches. In Rome they also met up with Princess Augusta’s cousin Hereditary Grand Duke Friedrich Wilhelm of Mecklenburg-Strelitz who she knew already from family gatherings in Germany. After entering society the topic of marriage became one of discussion. In November 1840 while travelling in Germany it had been reported that Princess Augusta was to marry the future Grand Duke Carl Alexander of Saxe-Weimar-Eisenach who had been in London society the previous summer and spent some time with her. Another rumoured suitor was the future Duke Ernst II of Saxe-Coburg and Gotha, the brother in law of Queen Victoria who reportedly favoured the match. No engagement in fact occurred until October 1842 when it was announced that Princess Augusta was to marry her cousin Hereditary Grand Duke Friedrich Wilhelm of Mecklenburg-Strelitz. The news was reported in Neustrelitz on 27 October with the assembling of the court for congratulations to be presented to her uncle and future father in law Grand Duke Georg. In Britain the formal consent of Queen Victoria was given in a Privy Council meeting on 2 November. Shortly before the wedding a bill was agreed in the Houses of Parliament granting Princess Augusta an annuity of £3,000 a year to begin on the death of her father. The wedding of Princess Augusta and Hereditary Grand Duke Friedrich Wilhelm took place on 28 June 1843 in the Chapel Royal at Buckingham Palace in the presence of her parents, her cousin Queen Victoria, her husband Prince Albert and other members of the Royal Family. The Hereditary Grand Duke and the new Hereditary Grand Duchess spent the first few days of married life at Cambridge Cottage in Kew where after their arrival in the early hours of 29 June they were welcomed onto Kew Green by a triumphal arch, a crowd of well wishers, a band of Scottish Fusilier Guards playing the British national anthem and a fireworks display. On 3 July the residents of Kew again turned out to bid an emotional farewell to Princess Augusta on her departure from her family’s home for her new home in Mecklenburg-Strelitz, which was where her grandmother Queen Charlotte had come from over 80 years beforehand upon her marriage to King George III. 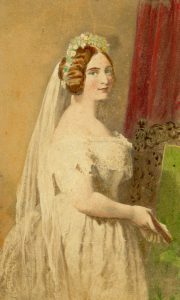 The marriage contract, which had between signed on 23 June 1843 and formally ratified in September 1843, set out the rights of Princess Augusta upon her marriage such as confirming her annuity and enabling her to continue celebrating divine service according the rites of the Church of England once she was in Mecklenburg-Strelitz where the majority of people belonged to the Lutheran Church. As the wife of the heir to the throne, once in Mecklenburg-Strelitz the new Hereditary Grand Duchess Augusta returned to living in surroundings that were much grander than those that she had been used to living in back in Britain as within her new home in the Neustrelitz Palace, she had at her disposal a bedroom, a dressing room, two sitting rooms and a large drawing room. Although the city of Neustrelitz was much smaller than London and the Hereditary Grand Duchess Augusta was happy in her new home, she would always have a special affection for Britain and would visit as often as she could, greatly enjoying the social side of London where she could visit the opera or theatre and attend various dinners and balls. Her first such visit to Britain after her marriage took place just a year after her wedding taking up residence at her parents’ homes at Cambridge Cottage and Cambridge House. During this trip to Britain the Hereditary Grand Duchess Augusta was pregnant. As her parents wanted her to give birth in Britain she prolonged her stay there until after the birth which took place at Cambridge House on 13 January 1845. Tragically the child named Friedrich Wilhelm only survived birth by a few minutes. After recovering from the tragic loss Hereditary Grand Duchess Augusta left Britain in May 1845 having spent ten months there in total. She was reunited with her family later that year, welcoming them in October 1845 to her home in Neustrelitz and spending Christmas together. Hereditary Grand Duchess Augusta gave birth to her only surviving child, Hereditary Prince Adolf Friedrich, on 22 July 1848 in Neustrelitz, in the midst of revolutionary feeling in Germany. In the autumn of 1848 Hereditary Grand Duchess Augusta with her son and parents in law had to briefly leave Neustrelitz for the Hohenziertz Palace due to rising tensions in the capital. Although the need never arose, hould the need have arisen for her to take permanent refuge away from Mecklenburg-Strelitz, Hereditary Grand Duchess Augusta had only one place in mind for where she would go, Britain. In July 1850 Hereditary Grand Duchess Augusta just missed being with her father the Duke of Cambridge on his deathbed, arriving in Britain with her husband and son the day after his death. Following the death of her father the annuity of £3,000 a year that was granted by the British Parliament at the time of her marriage started payment. In receipt of the payments from Britain, she would give back to the country by undertaking royal duties when in residence and by donating to charity and serving as a patron of different charitable causes. Hereditary Grand Duchess Augusta and her husband were spending the summer of 1860 in Britain when a telegram was received from Neustrelitz concerning the health of her father in law Grand Duke Georg. The couple immediately returned to their home and were with the Grand Duke for the last 10 days of his life until his death on 6 September 1860. In Mecklenburg-Strelitz the new Grand Duchess Augusta had the unfortunate coincidence that her birthday coincided with the death in 1810 of her husband’s much loved aunt Queen Luise of Prussia, who was born a member of the House of Mecklenburg-Strelitz. Although through his aunt her husband was a cousin of King Wilhelm I of Prussia, at the Neustrelitz court Grand Duchess Augusta encouraged and adopted a pointedly anti Prussian view which was shared by her husband. Anti-Prussian sentiment run particularly high during and after its successful 1866 war with Austria, when Prussia annexed a number of German states close to Grand Duchess Augusta’s heart including Hanover, where her family came from, and Hesse-Kassel, the home of her mother’s family. As consort to the reigning Grand Duke of Mecklenburg-Strelitz, Grand Duchess Augusta embraced her role as first lady and played a prominent role in society, by hosting dinners and balls and organising tea dances, dinner parties and charitable fete’s. She also was a patron and supporter of the Neustrelitz Theatre where she would personally oversee productions. Although she received her allowance from Britain and was the wife of a sovereign, Grand Duchess Augusta had rather modest tastes being against personal extravagance. In this regard she led by example, as apart from on formal state occasions she would dress modestly, and she would refuse to sanction additional expenses by rejecting having rubber on her carriage tyres even though they would have improved her own comfort. 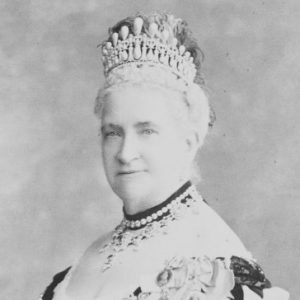 Away from her public role Grand Duchess Augusta took a keen interest in following political developments and enjoyed reading books and newspapers. She also had a love of music and would host musical evenings and private theatricals in her residence. She also especially enjoyed attending the Opera when she could. 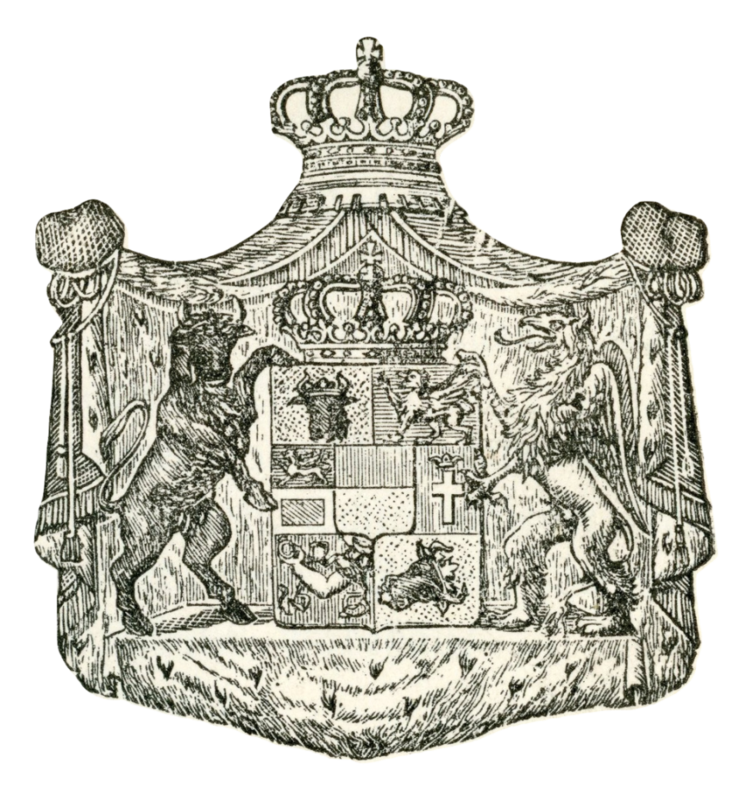 As well as being a granddaughter of Queen Charlotte, Grand Duchess Augusta had a further connection to Mecklenburg being a direct descendant of Duke Heinrich ‘the Lion’ of Saxony and Bavaria, the founder of the Bishopric of Ratzeburg, which came to the House of Mecklenburg in 1648 as a principality and formed part of the territory of Mecklenburg-Strelitz after its establishment in 1701. This historic connection was remembered in the 1880’s when a replica of the Brunswick Lion was donated at Ratzeburg Cathedral as a gift to Grand Duchess Augusta from her kinsman the reigning Duke Wilhelm of Brunswick. Aside from her primary residence at the Neustrelitz Palace, Grand Duchess Augusta would go onto acquire additional some secondary residences. She took on the Kepp Palace in Dresden in 1872 to use as a summer retreat, while on her regular trips to Britain she would make use of her mother’s rooms at the St James Palace until her death in 1889, after which she acquired a lease on what was to become Mecklenburg House in London, located a short distance from Buckingham Palace. With a keen interest in family history, within her homes Grand Duchess Augusta surrounded herself with family heirlooms and photographs. From her British family Grand Duchess Augusta had a particularly close relationship with her niece Princess Victoria Mary of Teck, the daughter of her sister Princess Mary Adelaide, with whom she would maintain a regular correspondence. In 1891 her niece became engaged to Prince Albert Victor, the Duke of Clarence and Avondale, the grandson of her cousin Queen Victoria and elder son of the Prince of Wales, so the future King of the United Kingdom. Tragically however Prince Albert Victor died in January 1892 before the wedding could take place. However Princess Victoria Mary was still destined to marry a future British king as the late Prince Albert Victor’s brother Prince George, Duke of York proposed and the couple became engaged, with Grand Duchess Augusta attending the wedding at St James Palace in July 1893, a month after she and her husband had celebrated their own golden anniversary among their family in London. With her niece’s marriage to the Duke of York, Grand Duchess Augusta became closely tied to the senior line of the British Royal Family. Grand Duchess Augusta and her husband were both selected to be godparents of her niece’s second child Prince Albert, later King George VI, although they were unable to be present in person for his christening at Sandringham in February 1896. In 1902 following the death the previous year of her cousin Queen Victoria, Grand Duchess Augusta travelled to Britain to attend the coronation of her late cousin’s son King Edward VII. As this was her third coronation and the first in over 60 years, in preparation for the ceremony her advice was sought on matters of protocol and etiquette. As there had not been a reigning king since the time of her uncle King William IV, she was also able to offer guidance to the new Queen Alexandra on the role of a Queen consort from the time of her uncle’s wife Queen Adelaide. 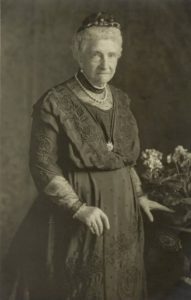 Having celebrated their Golden wedding anniversary in London, Grand Duchess Augusta and her husband’s diamond wedding anniversary was celebrated in 1903 in Mecklenburg-Strelitz where as part of the festivities, which were low key due to her husband’s failing health, the couple donated 25 Pfennig to every citizen. This would be their last wedding anniversary as Grand Duke Friedrich Wilhelm died on 30 May 1904, a month shy of their 61st wedding anniversary. Grand Duchess Augusta was not with her husband at the time of his death, she received news of his passing while in Britain where she had travelled to after the death of brother the Duke of Cambridge in March 1904 where as the last surviving Cambridge sibling she had the sad task of sorting her possessions at her late brother’s residence and her childhood home, Kew Cottage, which was to become part of Kew Gardens. The Dowager Grand Duchess Augusta did not approve of the changes her son, the new Grand Duke Adolf Friedrich V, made to the Neustrelitz court which she felt were too militaristic and Prussian, she also disapproved of what she perceived as the extravagant tastes of her daughter in law the new Grand Duchess Elisabeth. Following the death of King Edward VII in 1910, the following year and much too her regret the Dowager Grand Duchess Augusta felt she was too frail to travel to Britain for what would have been her fourth coronation and witness her niece, now just known by the name Mary, be crowned Queen consort alongside her husband the new King George V. Back in Mecklenburg-Strelitz the Dowager Grand Duchess Augusta celebrated her 90th birthday in 1912 with great festivities and having not been able to go to Britain she had the pleasure of receiving her niece Queen Mary in Neustrelitz in 1912 where she spent a few days. In June 1914 Dowager Grand Duchess Augusta’s son Grand Duke Adolf Friedrich V died, being succeeded by her grandson Grand Duke Adolf Friedrich VI, whom she had a close relationship with and who shared her pro-British views. Not longer after her son’s death further trauma would befall Dowager Grand Duchess Augusta as the First World War broke out pitting the German Empire against Great Britain. Just days before war broke out Dowager Grand Duchess Augusta had received a telegram from the Lord Mayor of London conveying birthday wishes to her from the City of London. She was touched by telegram and that despite having been unable to visit London for sometime due to her advanced age she was still remembered there. After the outbreak of war, as she was resident in Germany the annuity payments that she had been granted by the British Parliament at the time of her marriage were suspended by the government. Throughout the war despite her advanced age she concerned herself with finding out information on both British and German prisoner of war friends and maintained correspondence with her niece Queen Mary via another British princess, the Crown Princess of Sweden who was born Princess Margaret of Connaught. The Dowager Grand Duchess Augusta died peacefully in Neustrelitz at 2am on 5 December 1916 aged 94. Proud to the end of her position as a British princess, on her deathbed she had a message sent to King George V that it was a “stout old English heart which is ceasing to beat”. She was interned alongside her husband in Grand Ducal Family’s crypt in the Church of St John in Mirow. She was the longest lived British princess until surpassed by Princess Alice of Albany, the wife of her nephew Prince Alexander of Teck, later Earl of Athlone.